Visitors to the Spill (and social media) have already had the weekend to digest the cover of the latest issue — it features the looming top-noggin of North Korea’s leader. The cover artist, Eric Drooker told Michael Cavna in a Washington Post piece: “I came up with the concept for next week’s New Yorker cover when I realized how little I know about Kim Jong Un. He’s an enigma. Who knows what goes on under the hood?…All we can see is the tip of the iceberg — an incomplete picture.” Fair enough. Before getting to the cartoons this week, and instead of zipping through the GOAT (Goings On About town ) section, I’d like to mention a couple of non-cartoon graphics that made me pause, for better or worse: a painting on page 6 by the artist Brian Calvin and a (colorized?) photograph on page 12. I won’t say which made me pause for the better or which made me pause for the worse; the Monday Tilley Watch is not my soap box — it’s the curb I sit on while watching a parade go by. Mr. Borchart, who has been contributing to the magazine since September of 2007, uses one of the most reliable tools in the cartoonist’s kit: a mash-up of fantasy and the all too real. As with every new cartoon I come across I automatically recall some previous cartoon with a similar stand-out characteristic — in this case the unicorn. 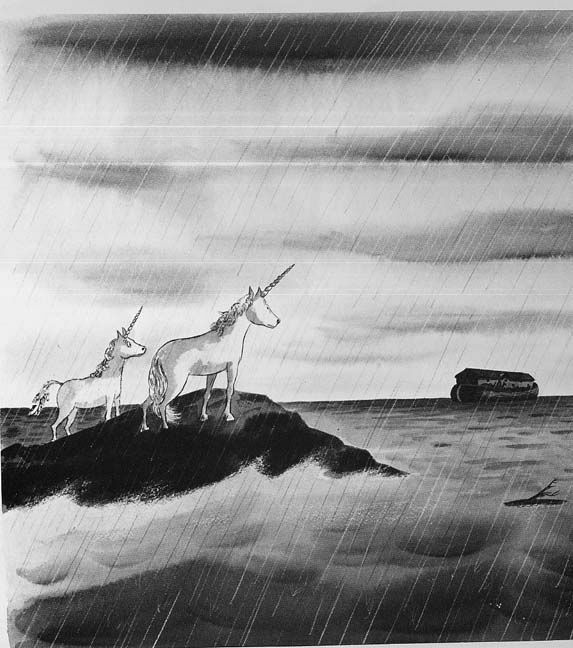 I cannot see a drawing of a unicorn and not picture this classic Charles Addams drawing. It appeared in The New Yorker, March 10, 1956. Four pages later is a subway drawing by J.A.K. (Jason Adam Katzenstein — his first New Yorker cartoon appeared in November of 2014. It’s not my imagination, the magazine has run a goodly number of New York City subway drawings in the past few months (I’m not going to go back and count them. Trust me). It has dawned on me this very second that I could probably summon up a Charles Addams classic drawing somehow related to every cartoon in this issue. In this case, Addams had a number of subway classics (here’s one). But enough of that game. Seven pages later is a Joe Dator bar scene. Mr. Dator’s first New Yorker appearance was in August of 2006. It’s always a gift when the cartoon gods hand a cartoonist a one-word switcheroo to make for a successful caption: in this case using “stopping” instead of “starting.” Fun sidebar: Mr. Dator has a podcast, Songs You’re Sick Of. A Roz Chast three panel drawing is next (her first cartoon appeared in 1978). I like that Ms. Chast has ventured out of what we’ve (perhaps?) come to think of as a Chastian living room setting. We get to see a kitchen and foyer. I’d love even more of a tour around her cartoon environment. For instance: let’s see the basement…or the attic (It’s possible we’ve already seen these spaces… Ms. Chast has published well over a thousand cartoons in the magazine). Ten pages later, after a long piece about North Korea, is a Stephen King-ish Will McPhail drawing. I have great sympathy for Mr. McPhail’s cartoon pinata in this cartoon. I’m resisting the temptation here to recall one of many many Charles Addams’ drawings featuring mischievous children (or a mischievous child). I think I can safely say that none of Mr. Addams’ cartoon children ever threatened to harm a cartoon pinata. (Mr. McPhail’s first New Yorker cartoon: December of 2014). On the very next page is a thief-in-a-in-home drawing by newcomer Maddie Dai. As mentioned earlier in this post and previous posts, I try hard to keep subjectivity in check in the Monday Tilley Watch, but this drawing gets a check plus. Can’t wait to see what the Cartoon Companion boys say about it later this week (their stock-in-trade is cartoon dissection and evaluation). Ms. Dai’s first New Yorker appearance was this past June. Three pages later is a BEK (Bruce Eric Kaplan) drawing. Signature style, signature caption. Mr. Kaplan’s first drawing appeared in 1991. Six pages later, an Emily Flake drawing, sort of in the area of Mr. Borchart’s: a mash-up of contemporary technology (texting) and slowing-moving-out-the-door lingo: actually hanging up a phone (and slowly-moving-out-the-door actual activity of hanging up a phone). Ms. Flake’s first drawing appeared in September of 2008. Five pages later, a drawing by Barbara Smaller. Like Mr. Kaplan: signature style, signature caption. Here Ms. Smaller avoids the cartoonist’s go-to shrink’s divan for the patient and opts for a sofa. Three pages later is the last drawing in the issue (not counting the Caption Contest drawings), and it’s by the ever reliable Paul Noth (in earlier years such cartoonists as James Stevenson, Frank Modell, and Donald Reilly were among the magazine’s sturdy cartoon oaks (seemingly) effortlessly providing us with good work week after week after week (after year after year after year). 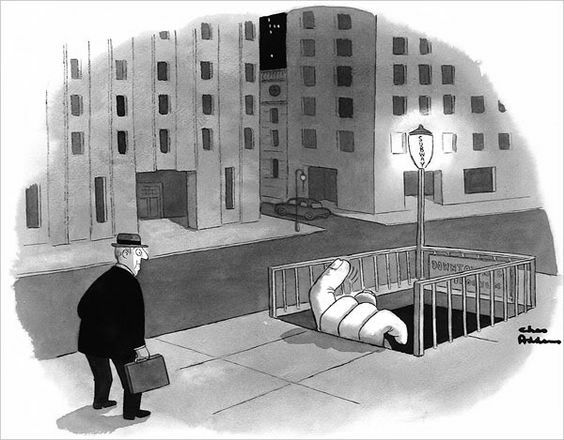 Mr. Noth began at the New Yorker thirteen years ago.